Lilacs & Roses, Wine, Friends…and Myrtle Murder! 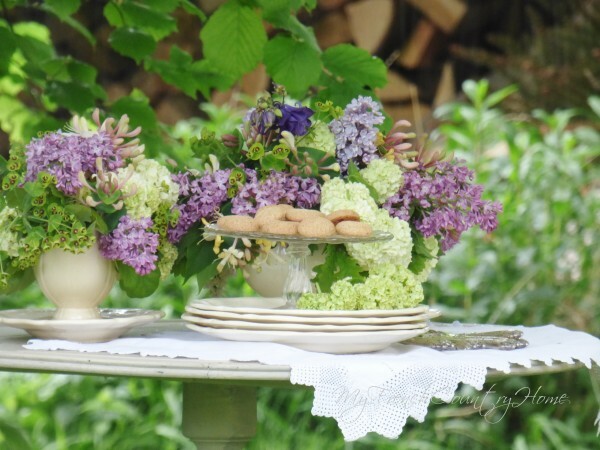 Saw this on a favorite blog…My French Country Home…SO, I just had to share…my lilacs, too, are in full and oh, so fragrant bloom. Just walking in the garden anywhere near the huge bush, the scent invites me to come closer…and I do! Already I’ve cut more than a dozen little bouquets for the bedroom and living room…I’m sad to say the last few blossoms are beginning to fade…However, last year I found a new lilac variety that “promises to re-bloom” and planted her near the dry creek bed…maybe this season I will find out how true the claim might be. 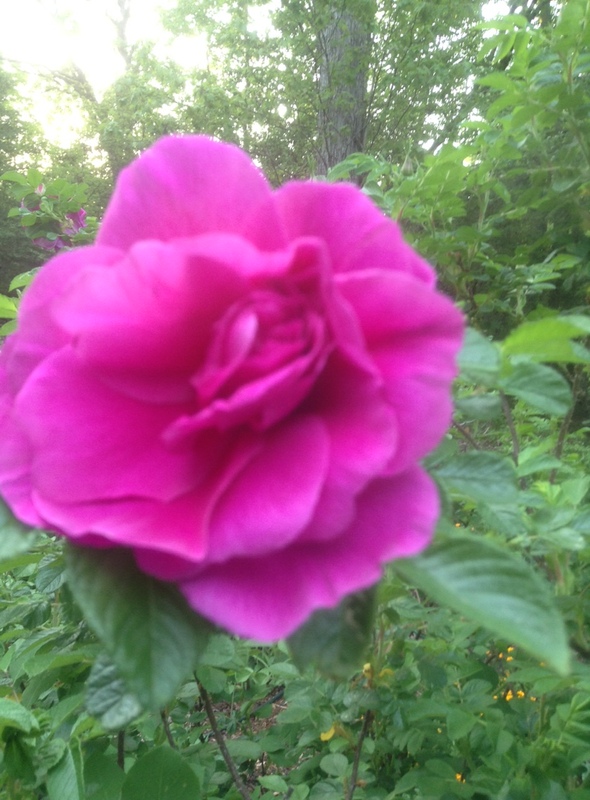 Roses…last time I wrote about my Autumn Damask rose already in bloom. 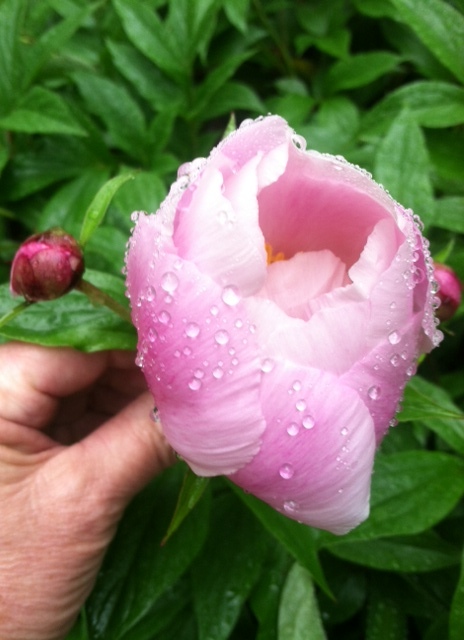 So many buds opened with the warm, sunny weather that I decided to collect petals… here she is in glorious bloom! 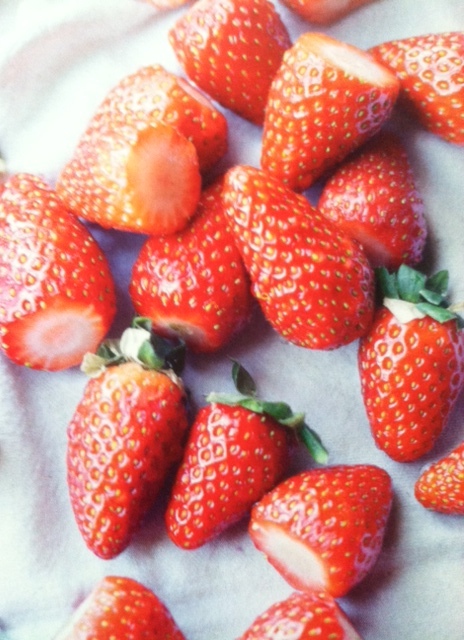 I pluck the petals and spread them on a dishtowel in my old collecting basket. Once the petals have thoroughly dried, it is then time to store them in a nice little glass jar. 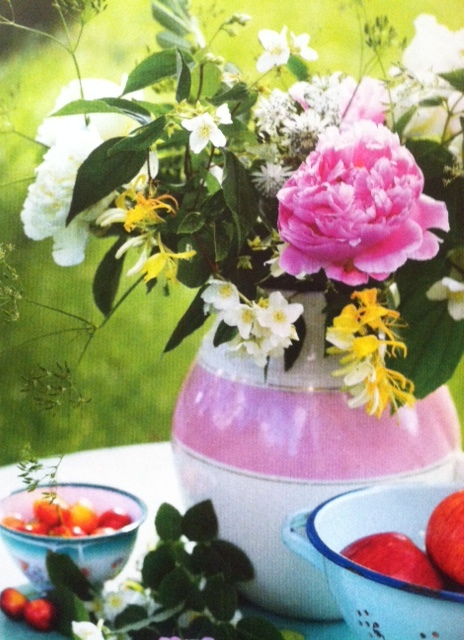 Opening the lid to use the petals for baking…oh, sublime…the fragrance is like sniffing a fresh rose! A few other early blooming roses are shown here…the deep pink is the gently climbing and nearly thornless, Zephirine Drouhin, a lovely Bourbon rose that has a spectacular showing in spring followed by some blooms throughout the season and a final closing performance in fall. The softer pink/peach bloom is Cornelia, a Hybrid Musk rose, that has a large shrubby, sprawling growth habit. 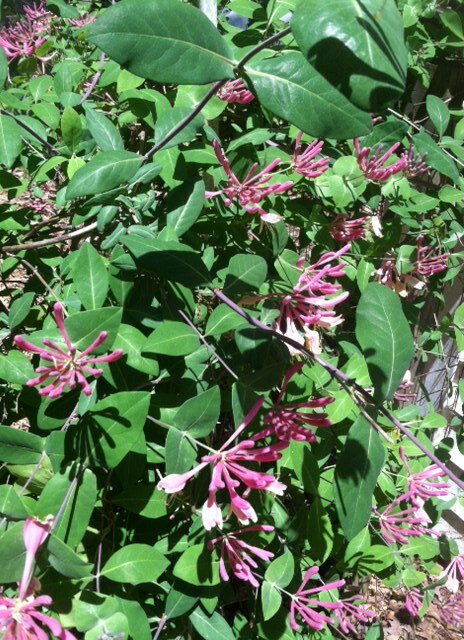 Once again, her fragrance is divine…especially as it crawls along the fence by the chicken house! My package from the Antique Rose Emporium arrived two weeks ago with two more roses for my garden…I’m preparing spots now for Madame Alfred Carriere and a selection from Mike Shoup’s Pioneer Collection, Landmark Rose, that I wanted to experiment with…will let you know how it grows and blooms! 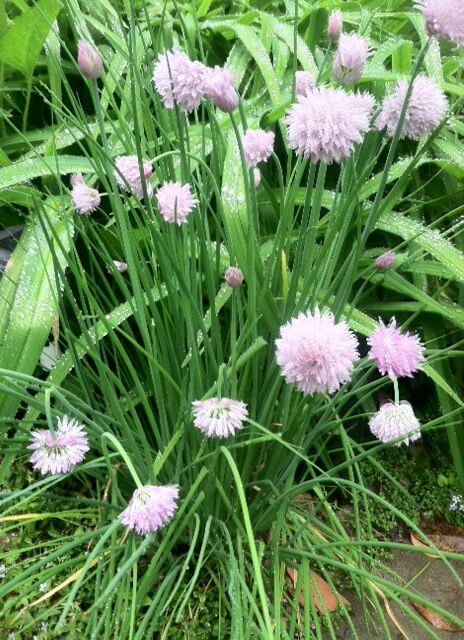 As for herbs, I’ve added more basils near the tomatoes and by the roses, more chives… and lemon thyme between the path stones to give off a nice fragrance! French thyme and onion chives as a border by the new rose, and seven new Provence lavender plants on the slope, near the dry creek bed, in poor soil and lots of sun in the afternoon! 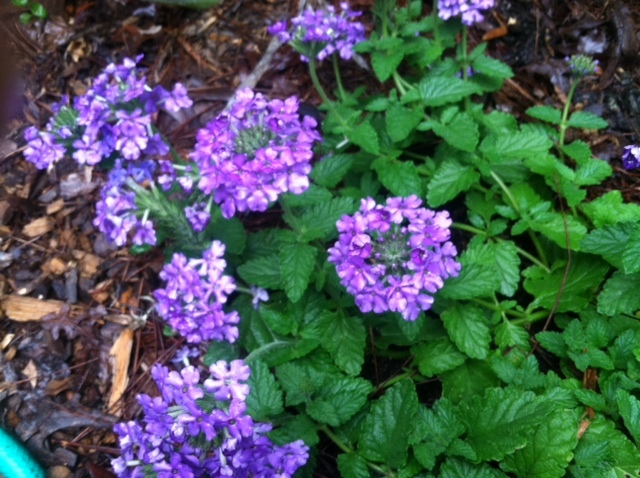 This is a new perennial verbena that I found at Wilton Cottage…it has a very different shade of lavender/lilac bloom than the older deep purple variety I’ve used in gardens for years. This is one of my standard perennials for landscape design…it grows and blooms all summer long, does great in full sun, and it has a nice crawling habit that makes it perfect for trailing over stone walls or even as a groundcover. This poor lavender iris is drooping in the rain storm today…I wanted to get the bloom before they finally gave up…oh, and the fragrance is like softly sweet grape soda, sorta! The yellow and pink iris is one of a very old variety that I dug up at an old house being torn down years ago! Soft fragrance of a dusting powder! This beauty is the first bloom on a Tree Peony I planted over 6 years ago and it is finally flourishing by sprouting over 15 flowers! I must admit it has been slow to mature…likely because it gets only 2-3 hours of morning sun! 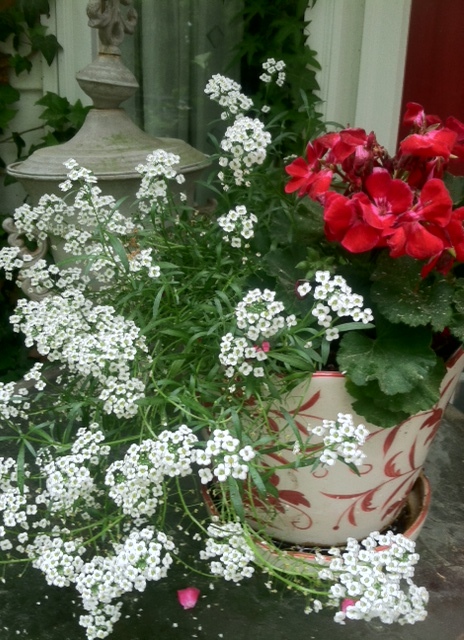 This lovely container sits by my RED French doors leading into the house…every spring I plant it with geraniums and sweet alyssum! NOW, as to poor MYRTLE!!! Below is a tragic example of how you should NEVER, EVER trim or prune a crepe myrtle. This poor work is what a garden or yard person might do as a result of seeing some trees hacked like this on old commercial properties. This severe type of pruning is NOT the way to handle these graceful trees. Lopping off branches leaves unsightly knots or knuckles, weak branches and new growth that is more susceptible to powdery mildew, sooty mold and insect problems. Crepe myrtles in no way benefit from this practice! So my advice…get a nice big glass of Wine and sit by the pool, patio or deck and just enjoy the garden…STOP finding more to do than necessary…However, do ask me if you have problems and I’ll reply with directions/suggestions. Okay, so now it’s late and I need to take Holly for a walk in the drizzle and then come back for my glass of wine…a toast to all my friends! May 1st celebrated in many ways around the world...I remember May 1st as May Day…a day to dance around the Maypole, celebrating spring and…having cake!! Usually a beautiful rich yellow cake slathered in fluffy white frosting covered with freshly grated coconut. In France, May 1st is celebrated with the custom of giving little bouquets of Muguet or Lily of the Valley to friends and loved ones…and always a little sprig for yourself! On every street corner throughout France, vendors can be found selling these delightful little bouquets. The flowers are sweetly scented tiny bell-shaped beauties that grow best in shady, moist conditions…I remember them covering the ground just under my Grandmother’s huge front porch and their fragrance lingering in the air for days. I planted a few “pips” in my garden several years ago and they now cover the entire spot every early spring. 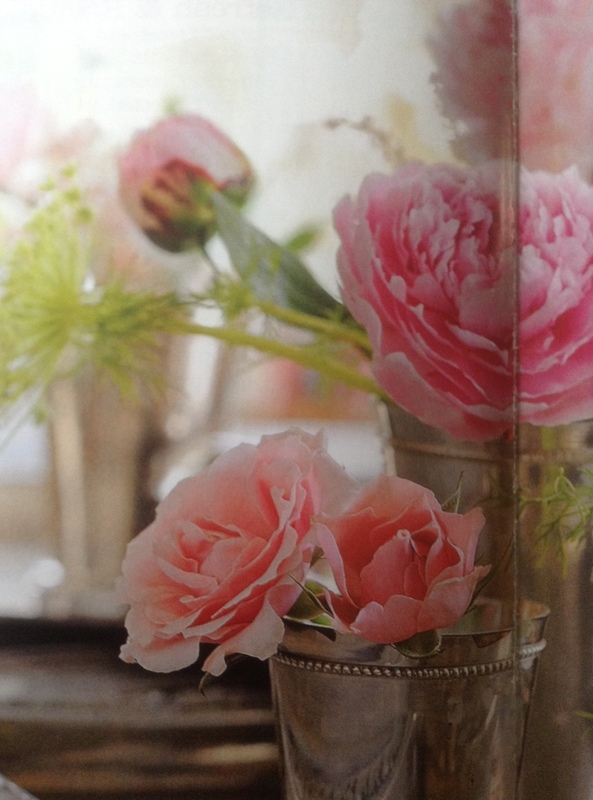 There are finally enough to pick a few sprigs for the tiny vase next to my bed…’till I’m ready to share! There is something, to me, about all things French that make them stylish and ROMANTIC! I remember a May afternoon spent walking through a market in the south of France…a large woven basket, I still use for shopping, filled with some goat cheese wrapped in green fig leaves, a fresh still-warm baguette, a bottle of local Rose’, a few bars of handmade lavender soap and a new pair of red espadrilles and of course, a lovely bouquet of Muguet. Later, nearing dusk, we ambled down the lane towards a small stone house with lacy curtains fluttering in the breeze…our little cottage for the night! Roses clambered up the wall and eventually onto the roof…lavender just starting to bud…such wonderful fragrance added to a night sleeping with windows open to the night air. ROMANCE…L’Amour, ah sigh…loves labors are never lost as one generation after another tend the same gardens, the same roses that climb ancient stone walls, the same fruit trees, the same vineyards and the same perfume makers in Grasse distill hand-picked summer blossoms…every spring and summer in Provence, the air is filled with the scent of flowers that inspire the romance of perfumes…such perfumes are one of France’s great gifts to the world! Early blooming roses capture the beauty of spring, their delicate petals and fragrance always a delightful WELCOME to the season. “Autumn Damask”, a favorite antique or old European rose, has a strong fragrance used in making some of the finest perfume in the world…she blooms profusely in spring, followed by scattered blossoms through summer into fall. Every day during the first burst of blooms, I collect a few to use for drying…simply pull the petals away from the center stamen and spread them on a linen dish cloth, cover with another cloth and let them dry for several days. When completely dry, store in glass jars. I use them to make Rose Petal Scones for special friends and rose water for soaking hands and feet. Of course, you would only use the rose petals for cooking if grown organically. 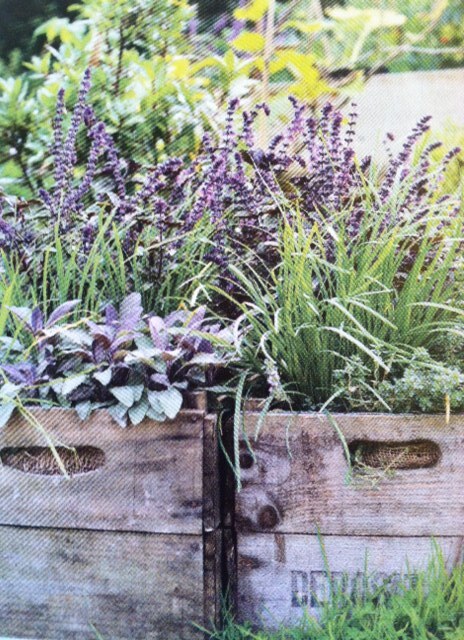 Magic of May, a sweet idea…old wooden boxes can be used for growing annual herbs like sweet and cinnamon basil, cilantro, and parsley while perennial herbs such as sage, onion chives and thyme also work well in containers…the wooden boxes simply add a bit of nostalgia and vintage charm to your garden. The right plants for your garden…many gardeners often choose plants based on what they want rather than actual growing condition…such are the quirks of human nature. 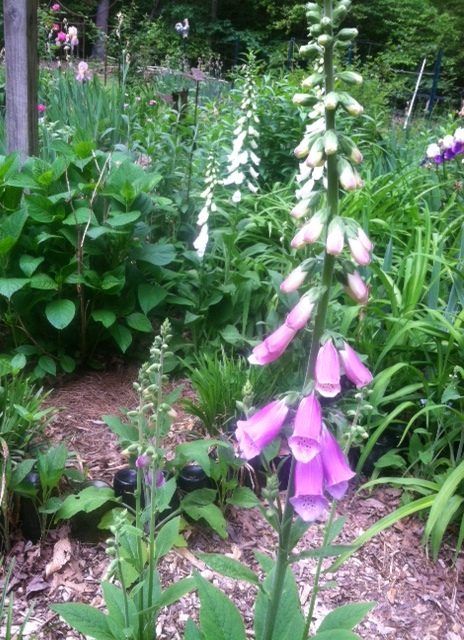 I stress the need to learn to love the plants that do well where you live…ADAPT! That’s why I often use and suggest using containers to grow plants that prefer a different or less acidic soil than what I have…and I can move them around as needed. up the wall clinging to a trellis by the open window…ferns at the base simply add the lovely green ruffle to cover the vine legs. 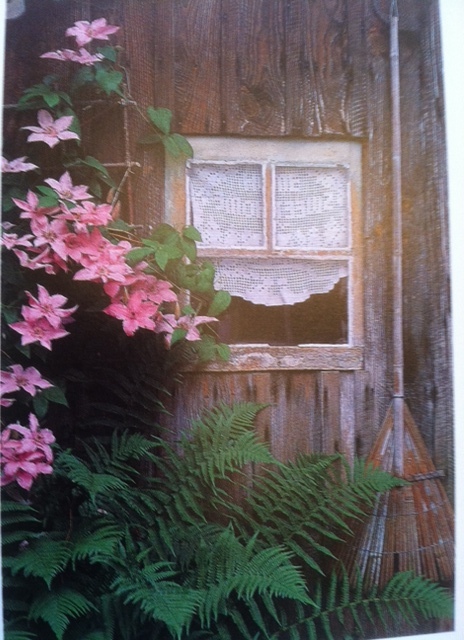 Clematis vines can be fragile and initially need to be guided onto a trellis. Each season I do trim them back by about 1/3, depending on bloom time and variety. a clematis adds much needed bloom, scent and upward direction. 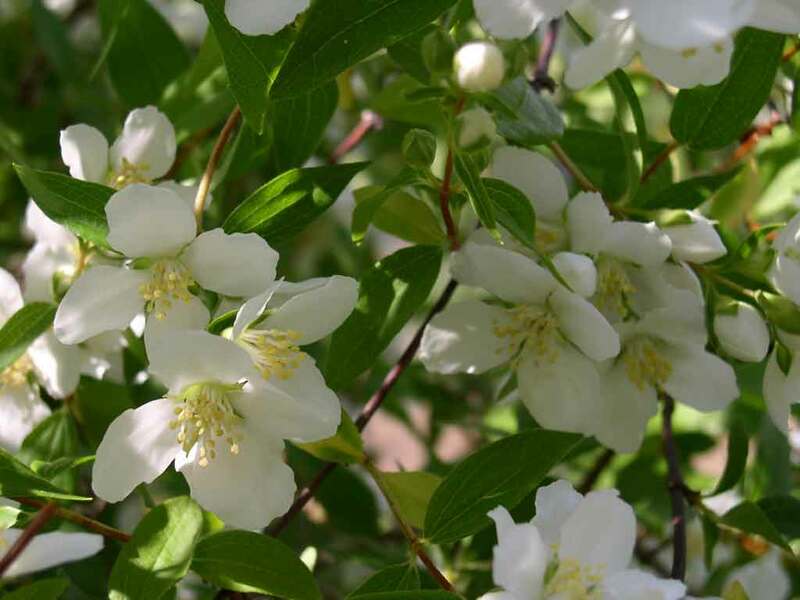 Choose several to use around the garden but don’t forget one of the best…Sweet Autumn Clematis…a late summer into fall, very fragrant white blooming paniculata !